A subtle and silent killer flows in the life stream of the Body of Christ—a virus of devilish design and effectiveness. This masquerader promises life, but provides only death. Sweet to the mouth but bitter to the belly, it is the Venus Flytrap of the kingdom, sending out promising fragrances, only to devour those who succumb to its allure. Like a stealth bomber or hypertension, it avoids detection until the damage is done. Preying on the weak and strong alike, it effectively neutralizes thousands of unaware believers. Its discreet presence belies its leavening permeation, devastating individuals, families, local churches, and ultimately the Gospel. What is this silent killer? Legalism. Like wolves and bison in Yellowstone, legalism and the gospel are at eternal enmity one with the other. The taproot of legalism runs deep in humanity. Its fountainhead is in Adam and it flows freely in us all. Trust in our correctness on certain theological tenets, precepts, and points of view, and a commitment to biblical conservatism does not automatically immunize us. Rather, without the experiential reality of the Person of Christ administered to us by the Holy Spirit, we will be perfect incubators for an infection of legalism. It’s possible to be completely loyal to Paul’s doctrine and know nothing of Paul’s life: the curse of arid evangelicalism. We all have a resident Pharisee within. Whether he politely minds his business with clean hands and a manicured life or trashes the place in drunken disregard makes no difference. He signed a lease in Adam and must be evicted. As Walt Kelly’s comic strip character, Pogo, said: “We have met the enemy, and he is us.” This is not about pointing a finger at others. It is about cleaning the mirror. Legalism is more than external rule observance or non-observance. It is a system of thought, an approach to life and life’s God. It is the belief that one’s personal character and holiness grants special and intimate access to God’s presence and blessings, thereby establishing oneself as superior to other believers. The legalist says, “My acceptance and advance in God is contingent upon, or improved by, my behavior.” Good behavior earns me more of God’s favor, which in turn impels me to higher levels of spiritual life—“the next level.” God’s love is conditioned on the legalist’s performance. A legalist’s God rewards (blesses) for good behavior but punishes for bad. Legalists will be obsessively introspective, self-centered, and manic in “trying to please God.” Taken up with the shine and maintenance of their vessels, legalists will be blindingly indifferent to the need and plight of others around them. The end of legalism is to be relationally alienated from God, from one’s self, and from the rest of humanity. Legalism believes that God’s grace is a kind of divine public assistance plan, provided by the Father and subscribed to by humanity because it is weak. Grace is little more than the spiritual coupon I cash in when I have run out of my own resources, rather than the participation in the overflow of the covenantal life and love of the Trinity. God forbid! We are not just weak in Adam—we are dead in Adam, disqualified in Adam. We do not need a little help from a heavenly welfare agency. We need, and—praise be to God—have been freely given, a completely new life source! Sanctification–holiness–spiritual maturity (or whatever one wants to call it) results as life is yielded to, not as achievement is attained. Spiritual advancement in God’s Kingdom is a death-resurrection process, not a spiritual housekeeping process. 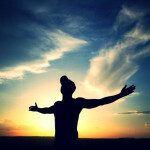 The extension of His life in me, and in the world, is not related to how well I can adorn myself with spiritual virtues. It is about the death I am willing to embrace that His life might be made manifest through me, at all times, in all places, under all circumstances. Any thought, action, or deed that has its source outside of Christ and Him crucified, outside of His life within us, is fundamentally legalistic. Any philosophy, biblical or otherwise, any behavior, noble or ignoble, that supplants the place and preeminence of Christ and the reality of the Holy Spirit is fundamentally legalistic. It is contrary to the New Covenant Gospel of grace which must be preached with power and illumined by the Holy Spirit. 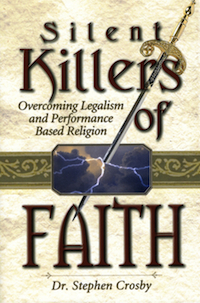 This blog is an excerpt from our title: The Silent Killers of Faith: Overcoming Legalism and Performance-based Religion It is available in all formats at www.stevecrosby.com. Great post – yes, this is a pervasion issue, more than many realize. It really is about relationship and walking in the Spirit, and being in love/relationship with Jesus. If we live by the spirit, we will not fulfill settle out in the low common denominator of the flesh (See Gal 5). Love John 15 (abide in me) and other advice and counsel of John – his epistles are full of this message about recognizing the reality of the life of Christ that is in us when we are in relationship with Him. Relationship, not routine. Relationship, not religion. Watchman Nee wrote in “Love not the World” – if we are not moving in the life and inspiration of the Holy Spirit, we are settling into the routine of the Kosmos (Greek for the worldly order and arrangement, legalism, routine, etc). Where there a flow of life, there is vitality and freshness – but when things settle out, they become routine and stagnant.